Vince McMahon and Stone Cold Steve Austin got back together for a unique venture on the WWE Network. Austin interviewed McMahon on a live podcast and in classic fashion, combined for a fun and entertaining production. 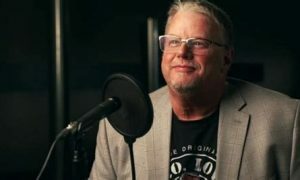 Steve Austin has quickly made a reputation as one of the best celebrities gone podcaster. Austin was the first of several former colleagues to jump into the podcast fray and just like his days as a pro wrestler, continues to improve with every outing. Austin has interviewed many big names in pro wrestling but his biggest catch was Vince McMahon. You knew it was going to happen. The Vince McMahon interview was a natural and Austin has said for months that Vince agreed to it. In typical Vince McMahon fashion, Vince took it up several notches by broadcasting the interview live on the WWE Network. I’ll give Vince some credit. Sure he gave his corporate speak but he appeared to be as brutally honest as he thought he was. In other words, he believed everything he said. He also appeared to have a great time talking about his past and reflecting on old stories, which is a side of Vince you rarely see. Austin also did a great job of asking hard questions and never seemed intimidated by the situation. Austin asked Vince most of the questions we have been dying to ask and here are some of the highlights of the momentous event. CM Punk just recently came out and blasted the WWE. Among other things, Punk said that the WWE sent him his termination papers on his wedding day. Vince blamed it on clerical and personally apologized to Punk. Vince said he’d love to have Punk back. 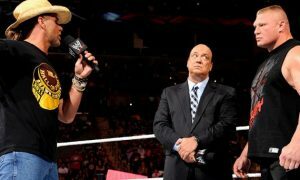 Vince cited disagreements he has had with Hulk Hogan, Bret Hart, and Ultimate Warrior and how they were able to work it out. He is confident that with the right communication he and Punk could work it out. Vince and Austin then discussed the time Austin walked out of the WWE. Vince said that Austin was a better communicator than Punk. Vince said he could use someone like a J.R. to bridge that gap. Austin asked him why the streak ended at WrestleMania 30. Vince said that it was time. He said that there was nobody on the roster like Brock Lesnar who fit that spot. He said that the Undertaker loves giving back but it was his decision. One of the more interesting conversations occurred right at the start of the podcast. Austin asked Vince about the current roster. Vince said that he feels nobody wants to take the brass ring. He said he can only do so much with the guys but they have to want it. He said that he feels nobody is as hungry on the roster today as they were in Austin’s era. He said that John Cena is the only one who had the drive to be the top guy. 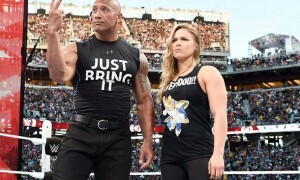 It was very interesting and strong criticism on the entire roster, sans John Cena. Vince talked about the writers and the differences in writing today. Vince told Austin that times were different and they needed the large amount of writers. Vince reminisced about booking with Pat Patterson at the side of his pool. Vince told Austin that they can’t book like that anymore. Austin asked Vince why Brock couldn’t be on television more. Vince had a great response when he said, “How many more guys can Brock Lesnar beat up?” Vince said that less is more with someone like Brock and that if he had him on television more, he wouldn’t be as special. All in all it was a great interview and I’d highly recommend checking out the rest. One of the best discussions was Austin and Vince talking about why they worked together so well and the magic they had. They also talk about Austin walking out and what it was like to work with Austin from Vince’s standpoint. The interview went over an hour and moved real fast. Check it out on the WWE Network.